The Wardens of the North reinforcement set adds more Stark commanders and units to the Stark forces of the Battles of Westeros core set, including the formidable Smalljon Umber, loyal Rodrik Cassel, and resourceful Galbart Glover. Use these new characters to take part in battles set in George R.R. Martin’s fantasy series... or make your own fantasy battles! 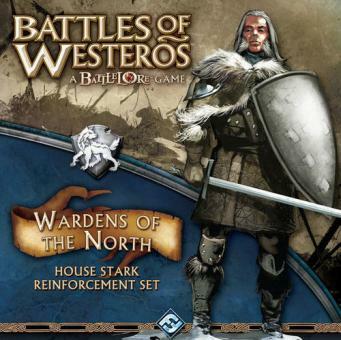 With a new Battle Plans book, 32 plastic figures, 32 cards, 8 terrain overlays, and 18 tokens, Wardens of the North will bring the honor and courage of House Stark charging into your Battles of Westeros game.